Some say that he swam from Australia to the UK with his book synopsis. Still others say that he can write novels by staring at his computer whilst drinking dry martinis. 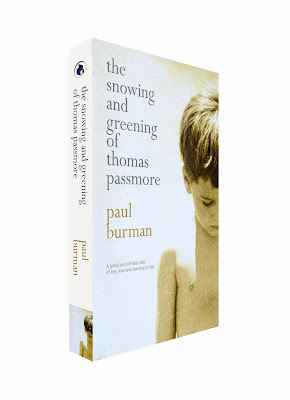 All we know is that he is called Paul Burman and his debut book is out today! I heard he strapped it to the leg of a kangaroo and it escaped onto a ship and hopped into London and ran smack bang into a publisher. So they say! I heard he's a genius. I heard he can't get the song Celebration out of his head, thanks to Mike, and that he's looking for a bucket of sand to stick this head into for a couple of days. Neither champion swimmer, martini-drinker, communicator with pigeons or roos, nor genius, the manuscript was accidentally created by a team of 15 chimpanzees who'd been given typewriters in the hope of proving that, if enough random keys were hit over a long-enough period of time, a scene from one of Shakespeare's plays could be randomly recreated. Trans-Pacific swimmers? Pigeon post? Stowaway kangaroos? Chimpanzees with... typewriters? Hey - let's celebrate the age of intercontinental literature when a great book is published after a lengthy exchange of smiling electrons. Into cyberspace then, Jon. The final frontier. Boldly going where no... troupe of chimpanzees have gone before.